How often should I practice singing for best results? You are here:Home Tips How often should I practice singing for best results? It’s great that you are taking lessons with a singing teacher, but is there anything you can do to get results even quicker? Taking regular lessons is a must, aim to have weekly lessons if you are serious about developing your voice and achieving vocal balance. But, there are ways to get great results outside of your lessons. Improvements can happen much quicker if you actually practice between your lessons. Your voice is a muscle after all. If you go to the gym once a week, sure you will start to build muscle and improve definition, but imagine if you went to the gym 4 or 5 times a week, you’d be building muscle much faster than with just one session a week! And the same applies to your voice, the more you do it, the quicker the results happen. 2. Pick the right amount of time! So you are practising, that’s fantastic! 3 hours later and you are still at it. Are you getting any benefit from it? Probably not! You have to pick the amount of time to practice based on your level as a singer. For example, if you have never sung before and have just started voice lessons, then doing 3 hours of practice won’t benefit you – the muscles in your voice aren’t strong enough to sustain 3 hours of exercises. But if you are an advanced singer, have performed for 20 years and have taken singing lessons for a while, chances are you will need a bit more than 10 minutes a day. Aim for at least 20 – 30 minutes vocalising with exercises and then at least another 10 minutes working through songs. The trick is to build it up. Start off with small, regular (little and often) sessions to build up your strength, and as you get stronger, work for a little bit longer each time. Always let your body guide you, though! If you are starting to feel tired or strained, then chances are it’s too much and you need to stop and rest. If it feels good, relaxed and everything is working well, then keep going. You wouldn’t run on a treadmill for 2 hours if you had stabbing pains in your back now, would you? Why should your voice be any different! Remember, even during a practise session, take a break! You would never do sets at the gym without resting between each set, so give your voice a chance as well! We all like to multi-task, but can you really hang that picture, balancing on the top step of the ladder, whilst doing a lip bubble? I’m guessing probably not, at least not to come out of it in one piece! You have to pay attention to when you practice, otherwise how do you know if you are making the right vowel, or the right sound? Try and keep your attention focused on your practice, mindless practice will not get you the same results as a focused session. 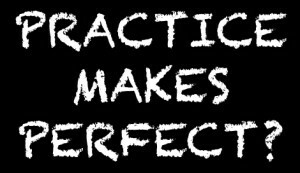 So many times we come across this saying “Remember, practice makes perfect!”, normally from our parents. Practice doesn’t make perfect, perfect practice makes perfect. Well lets head back to the gym for a second. If you did 3 sets of 12 bicep curls with bad posture or bad form, is that practice makes perfect? Or are you just learning a bad habit and practising it over and over? Now what if you did the same 3 sets of 12 bicep curls with perfect form and posture. That my friend, is perfect practice! Check those biceps out! The same goes for your singing! 5. Dear Diary . . . So by now you are regularly practising, for the right amount of time, focusing on your practice, and doing everything you can to do it correctly. But how are you tracking your progress? How do you know if you are getting better? Have you thought about keeping a singing journal? A record of your singing practice sessions? Why not try it? Jot down what worked well, what didn’t work. Did things feel easier or harder today? Did you think of a question for your singing teacher? Then when you go to your next lesson, you can take your journal entry with you and get help and feedback from your teacher. Just think how pleased your singing teacher will be with you, I promise you it will make their day! 6. Rome wasn’t built in a day! Cut yourself some slack every now and then. Rome wasn’t built in a day and neither is your voice. Yes, we can make great progress in a session, but getting impatient if your voice doesn’t suddenly become the voice you want overnight hampers the process. Frustration can kill progress and when you are working so hard on the 5 other steps, why knock yourself back like that? So if you feel frustration, take a moment, pause and let the frustration pass. Remind yourself that by practising you are getting closer to where you want to be as a singer. And hey, why not write it in your journal, and then you can look back and smile when you realise you were getting worked up over nothing! Ok so I lied, there are actually 7 tips, but its a quick one. Enjoy it! If you are dreading practising singing then why are you doing it? The more you reinforce your practice with a positive outlook and mindset the better! But that’s a whole different blog post! So there you have it, our 7 tips for how to get the best results when practising. I hope you enjoyed it and feel motivated to get practising on your voice! Feel free to leave us a comment below and share your top tips for practising.